Three Wishes Publishing Company, 9780979638015, 32pp. Justin. Mario, and Marcus are best friends. Saturday is their favorite day to hang out together. This Saturday is different, they are bored. It takes all three of them and their dads to make this Saturday, the best ever. Join this trio of boys as they find themselves in a grand adventure. On Your Mark, Get Set, Go! has earned awards as an Indie Excellence Finalist, International Best Books, Creative Child Magazine Seal of Excellence. How many parents have heard the dreaded "I'm bored!" from their children at least once? It a world full of stuff, it can be easy to overlook what is right around us. Rather than scold or lecture, Justin's dad comes up with a plan that ends up making this day one of the best ever. 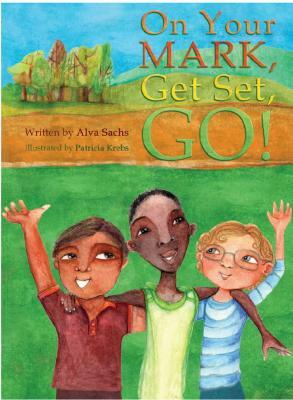 There are so many things I love about "On Your Mark, Get Set, Go!" by Alva Sachs , that it is hard to know where to start. A book that shows kids and their dads together in a positive way is such a treat. A beautifully bound hardcover with stunning illustrations by Patricia Krebs, this book will last for a long time. Definitely one of those you get and keep around for the grandkids someday. Values like responsibility, creativity, friendship, respect, and diversity are all woven skillfully throughout the story. Reading this book inspired me as a parent and the kids loved it too! This is one of their regulars they ask for now - and now that it can come down off the review shelf, I am sure we will read it even more.